This is not a repeat of Windows RT: The exclusive partnership is bringing Win32 and Universal apps to ARM. 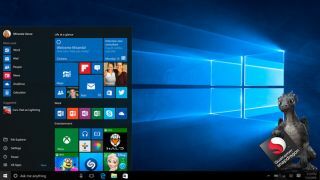 Microsoft's interest in bringing the modern Windows experience to ARM devices seemed rather short lived when it gave up on Windows RT, a version of Windows 8.x that was built for 32-bit ARM devices. It turns out Microsoft may have just been biding its time for a potentially more receptive audience. Both Microsoft and Qualcomm think that time is now, as they've partnered to enable Windows 10 on mobile devices powered by next-generation Snapdragon processors. "To deliver on customers' growing need to create on the go, Microsoft announced that Windows 10 is coming to ARM architecture through a partnership with Qualcomm. For the first time, customers will be able to experience the Windows they know with the apps, peripherals and enterprise capabilities they require, on a truly mobile, power-efficient, always-connected cellular PC," Microsoft said. Microsoft's pitch is that this partnership will enable hardware partners to build a variety of Snapdragon-powered Windows 10 PCs that run x86 Win32 and universal Windows apps. It specifically mentions Adobe Photoshop, its own Office suite, and Windows games. To be clear, Microsoft isn't doing this for all ARM processors, just those produced by Qualcomm, which happens to be a major player in the ARM space. Specifically, the two are focused on Qualcomm's upcoming Snapdragon 835 System-on-Chip (SoC) due out in the second half of next year. "Qualcomm Snapdragon processors offer one of the world’s most advanced mobile computing features, including Gigabit LTE connectivity, advanced multimedia support, machine learning and superior hardware security features, all while supporting thin, fan-less designs and long battery life," said Cristiano Amon, executive vice president, Qualcomm Technologies, Inc., and president, QCT. "With compatibility with the Windows 10 ecosystem, the Qualcomm Snapdragon platform is expected to support mobility to cloud computing and redefine how people will use their compute devices." Indeed it could redefine how people use their devices, and Microsoft already has a name for it—"cellular PC." The question is, will this succeed when Windows RT failed? That remains to be seen, but one thing Microsoft has working in its favor is the presence of x86 emulation this time around. And ARM processors have been improving at a dramatic rate the past half-decade, outstripping the gains Intel has made in its chips. ARM processors are now more than powerful enough to run lightweight notebooks—in fact, Apple's latest A7 ARM processor is already faster than the Intel CPUs used in its last MacBook Air, the same CPUs used in Windows Ultrabooks. Time for Intel to start looking over its shoulder.